It was big news when Moorlands Totalis sold last year. Zenyatta is due to foal soon and the press is waiting. I see Ravel had a big win in Florida recently. Well, I have some really big news for the horse world. And I mean Seriously Giant News. But the story starts small, like all good horse stories. Outside of the little Colorado town of Ramah, it was a normal week at Ruby Ranch Horse Rescue. Of course, normal for a horse rescue is not for the faint of heart. The manual labor alone would half kill mortal men. This week Ruby Ranch organized an intervention of sorts- negotiating with a dysfunctional (yet somehow loving) horse owner with 23 sick and extremely underfed horses, including 7 studs. A rational response to this situation would be screaming and hitting someone with a stick, but instead peaceful talks persuaded the owners to relinquish 12 of the horses. With all the legal paperwork and the participation of two other rescues, these desperate horses are getting help. Zander, the most at risk colt was released that same day, with an emergency stop at the vet on the way home. (Read about him here.) Ruby Ranch has not given up on those left behind, the job has only begun. And a horse came back to the Ruby Ranch this week. Lieutenant was adopted three years ago, and then injured by too much jumping. After using him up, his owner returned him. (See how beautiful he is here.) Sigh. I’m afraid the rational response of screaming and getting the stick comes to mind again, but Lieutenant needs help- and there is no time for the luxury of a temper tantrum about irresponsible owners. Abuse, neglect, slaughter- these people can wear you down. Thank God for horses. And small victories. I promised BIG horse news- this is Hobbit. He’s 45” tall and a total giant among horses. Hobbit is a rescue from Ruby Ranch- that I have fostered here at Infinity Farm the last few months. Fostering is a great way to help. The rescue horse stays with you, and yes, you pay for his care. But it’s all tax-deductible as a donation to Ruby Ranch Horse Rescue. Everyone benefits! 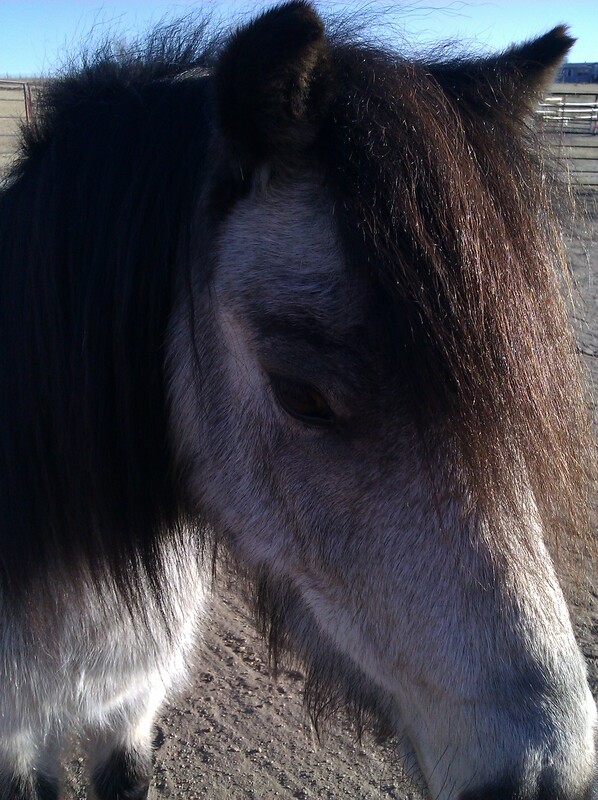 Hobbit is about the bravest horse I’ve ever met, but was people-shy when he arrived. I’ve really enjoyed working with him- such a smart boy. Last week, his Person finally found him. I think it will be a good home, she has lots of horse experience and they have a pet frog that is 25 years old. On his last day here, I went to his pen and he trotted over to me to get his halter on. He isn’t so shy now. As I groomed him up a bit, I got to tell him what a wonderful life was waiting for him. He was bright and beautiful as he hopped into the Ruby Ranch trailer for the two-hour trip to his excited new barn-family. I confess I got a bit teary. On one hand, he’s only one itty-bitty-teeny-tiny Life. But I guarantee Hobbit is as brave and proud as Totalis. He has all the hope and promise of Zenyatta’s baby. And it’s certainly a win as big as Ravel’s. P.S. Want to help Ruby Ranch? If you love a well-fed horse, consider donating in their name. P.P.S. Just got a Hobbit update. He shares a pen now with a 22 yr old mare, who is born-again as a giggling teenager. Hobbit always did fancy himself a ladies man. A teary start to my Friday morning before I head out to do some herding. Thank you for being you. You and Ruby Ranch are doing great things, though I bet sometimes you think it’s not enough. Each small victory makes all our hearts a bit lighter. I chose NOT to have a horse here though I’m often tempted but the responsibility is too huge and their lives are too precious. Hurray for Hobbit! SaraJane sends kisses and best wishes to him (I recall they had a brief affair last fall). Sounds like he has a great new home. So sad about all those neglected horses; thank goodness for the good people at Ruby Ranch. I hope Zander improves quickly. Poor Lieutenant; I hope his injuries heal well. He’s beautiful.